Understanding ChainLink's Products and Services. You will receive valuable key articles, case studies, and notifications based on your interests and parameters. Parallax View is not a magazine. It is a subscription service that provides you with unique Mini-Reports and Articles on the key issues you face today in the Policy, Process and Performance aspects of Supply Chain Management. Parallax View also provides important Technology news to keep you up to date on software and hardware developments, enabling you to get the most payback from your technology investments. $229.00 per year entitles you to much more than a magazine! ChainLink Research provides one research service. You get access to the whole database of research reports as well as interactive dialogue inclusive eKnowledge sessions with our people—fresh from major field assignments and research endeavors. Customers who buy many research reports from ChainLink find the premium service a more economical approach than a la carte. So, Premium customers get Parallax View Magazine, eKnowledge sessions, and all reports, bundled into one convenient service. 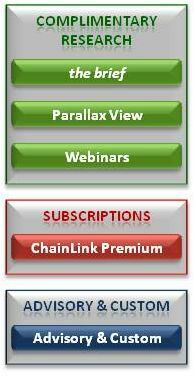 Premium customers also get discounts on ChainLink events and conferences like eLearning programs, and Parallax Views, ChainLink’s annual event. To Buy click here . ChainLink Research provides critical how to’s for clients around the world. Today’s busy professionals know that travel time is costly. On-Demand learning is a key component of our web based life. Complementary registration will get you notifications of these sessions. For more information on our services, please contact ChainLink directly.